Still think vaping is safe? You’ve probably heard about the weird new trend sweeping college and even high school campuses: Juuls. A lot of people think Juuls are just a funny, silly trend that will pass, but experts warn that the long-term damage that can be done by using Juuls may be far more dangerous than even their detractors first thought. JUUL Labs is an e-cigarette company that now makes up nearly 60 percent of the e-cigarette market. RELATED: What Is Juuling — And Why Are Teens So Tempted By It? According to the manufacturer, Juuls were invented in an attempt to give smokers a discreet way to quit by providing them with a disguised vape pen that’s also easy to use. However, Juul’s ease-of-use is the very aspect that makes it appealing to a younger crowd, and unique flavors like crème brûlée further entice many young people to try just one hit. Juuls are fueled by pods available in tons of flavors, from mango to mint. Each pod contains 50 milligrams of nicotine, which is as much as half a pack of cigarettes. The high nicotine content poses the greatest risk due to the risk of addiction. Nicotine, along with heroin and cocaine, ranks as one of the five most addictive substances on Earth. Nicotine creates permanent changes in the grey matter of the brain. Once a susceptible person tries nicotine even once, these changes increase each time the individual uses nicotine, carving new neural pathways and making the body chemically crave nicotine. The high nicotine-per-hit blast a Juul delivers makes addiction only a couple of drags away for some users. Even using a Juul once at a party can permanently make one more susceptible to developing a heavy nicotine habit. Nearly everyone nowadays knows the dangers of traditional cigarettes, but many mistakenly believe that vaping comes with fewer risks. However, vaping also increases one’s risk of heart disease and certain cancers just as smoking regular cigarettes does. Nicotine raises blood pressure, strains the heart and blood vessels and leaves the user at higher risk for stroke and heart attack. Juuls also increase the risk of lung cancer, throat cancer, and oral cancer, and users should be aware of the signs of these dangerous cancers. Symptoms of lung cancer include persistent coughing, coughing up mucus or blood, pain in the chest, shoulders or upper back unrelated to the strain of coughing, persistent infections such as bronchitis and pneumonia, and shortness of breath. Signs of oral cancer include persistent sores in the mouth, recurring red and white patches, loosening teeth, persistent bad breath, difficulty chewing or swallowing, and a lump or mass in the neck. 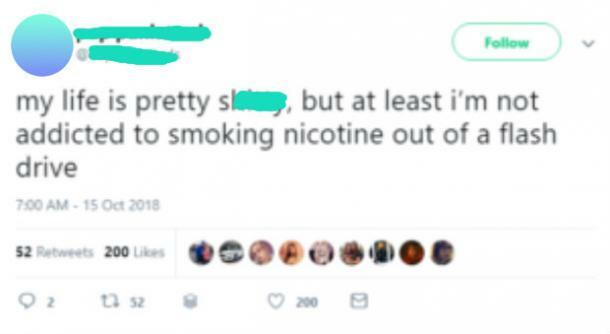 In addition, because of the high nicotine content, users can overdose on a Juul. Some physicians report treating victims of a Juul overdose who exhibited symptoms including seizures, nausea and vomiting. Most people know quitting smoking is far from easy. Far fewer, though, realize that it’s now being discovered that recovering from a Juul addiction can be even tougher. The good news is the same free resources that are available to help traditional cigarette smokers kick the habit are available for Juul users, as well. Many people recovering from nicotine addiction turn to patches. Others use prescription medications and some recover with the help of support groups such as Nicotine Anonymous. Often, a combination of therapies is the best way to kick the habit for good. If you or someone you love suffers from an addiction, you or your loved one should try to get help and recover. And everyone can and should do their part to help spread the word about the true dangers of this new trend. RELATED: Vaping Vs. Smoking Weed: What's The Difference? Kate Harveston is a leading women's health journalist and the founder of So Well, So Woman.